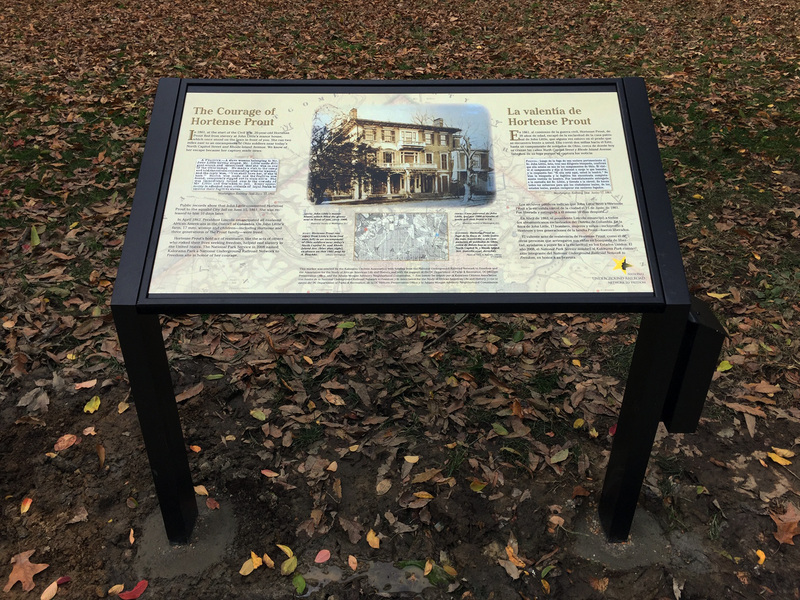 A new historical marker has been installed in Kalorama Park to honor 20-year-old Hortense Prout’s courageous flight to freedom from slavery on John Little’s farm in 1861. 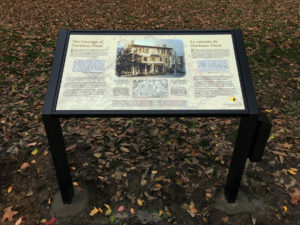 The Kalorama Citizens Association donated the marker with a grant from the National Park Service’s National Underground Railroad Network to Freedom and the Association for the Study of African American Life and History. The sign and an accompanying brochure are written in English and Spanish. The new Kalorama Park historical marker. The cost of the project was just under $10,000, which included writing and design, printing, and sign fabrication and installation. 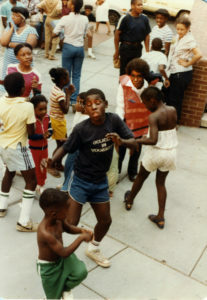 KCA is grateful to the National Underground Railroad Network to Freedom and the Association for the Study of African American Life and History for funding the project, and for the support of the Adams Morgan Advisory Neighborhood Commission (ANC-1-C), DC Historic Preservation Office, and DC Department of Parks & Recreation. KCA member Mary Belcher obtained the grant and directed the project. 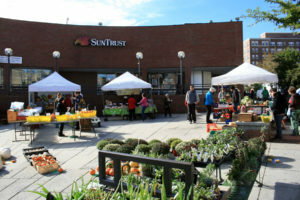 District of Columbia Superior Court Judge Todd Edelman in August 2017 issued a preliminary injunction to stop the destruction of the SunTrust Plaza at 18th Street and Columbia Road NW so that a trial can be held to determine whether the public has an easement to continue using the spot for a farmers’ market and other events. A trial was scheduled to begin April 17, 2018, but a series of motions have postponed it. The injunction remains in place. The Kalorama Citizens Association and Adams Morgan for Reasonable Development sought the injunction to stop the construction of a luxury condominium building by developer PN Hoffman. The planned building would cover the entirety of the 16,000-square foot lot, including the existing 4,000-square-foot plaza. Judge Edelman said the community groups proved at two hearings in July that the public would suffer “irreparable harm” if the plaza were destroyed before the court could decide whether a public easement on the plaza exists. KCA and Adams Morgan for Reasonable Development argue that developer PN Hoffman can’t build luxury condominiums on the plaza portion of the site, because the public for nearly 40 years has enjoyed an easement given to it by the plaza’s original developer, Perpetual Federal Savings & Loan Association. Adams Morgan activists in 1976 opposed Perpetual’s plans to build a branch at the site because of the bank’s discriminatory lending practices and because the vacant lot at 18th Street and Columbia Road had long been used by community vendors. In an historic effort, neighborhood groups took their case to the Federal Home Loan Bank Board in Atlanta, which had to approve the bank’s plan to open a new branch on the site. The groups dropped their opposition only after Perpetual agreed to change its lending practices, provide bilingual services, and build and dedicate a plaza for public use. Click here to read the transcript of Judge Edelman’s ruling, delivered from the bench when he granted the injunction. Click here to read the order granting the preliminary injunction. Click here to read the complaint, the motion for a preliminary injunction, and the motion exhibits. Historic Preservation: KCA is Adams Morgan’s chief advocate for historic preservation. Click on Historic Adams Morgan for details and reports. Parks: KCA supports the Biltmore Triangle Garden and sponsors walking tours of Kalorama and Walter Pierce Parks. Click on Parks for more. Neighborhood Development and Zoning: KCA works to mitigate challenges to our neighborhood’s quality of life that arise from development pressures. Click on Development & Zoning for more. Neighborhood agreements with liquor-serving establishments: KCA pursues voluntary agreements with liquor-license-holding establishments to ensure that the interests of residents are being served. See Business Agreements for details. TO JOIN KCA, annual dues are $25 for individuals, and $40 for two people living at the same address. Go to Join & Donate. TO CONTACT KCA, you can email President Denis James at denisjames@verizon.net or call him at 202-705-7411. Our mailing address is: Kalorama Citizens Association, P.O. Box 21311, Washington, DC 20009. KCA’s 2017 OFFICERS ARE: Denis James, President; Robert Ellsworth, Vice President; Bonnie Rowan, Secretary; Larry Hargrove, Delegate to the Federation of Civic Associations; and Jean Stewart, Delegate to the Federation of Citizens Associations.